Speakeasy is a simple internet speed test website that can check the bandwidth between your home network and one of eight US-based servers. The website is very simple to use, keeps a record of your previous test results, and lets you export them to a spreadsheet file. 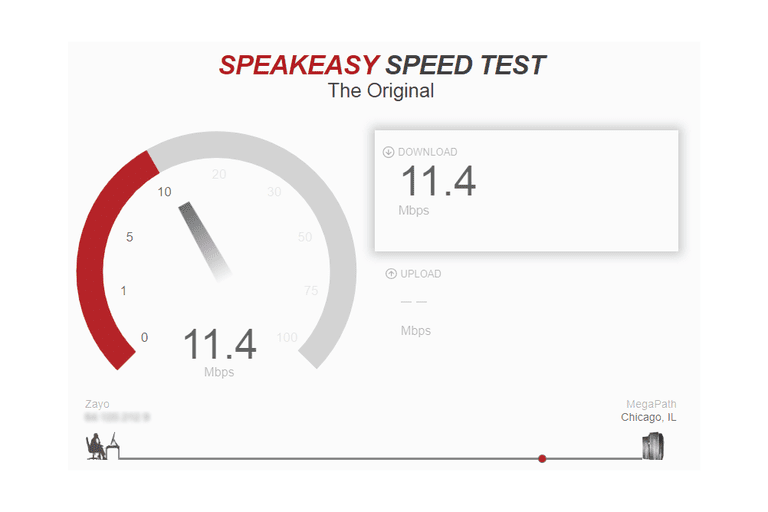 If you've used other internet speed test sites and found them too confusing to use or too hard to read the results from, then you might like Speakeasy. Just choose one of the server locations on the bottom of the screen and then hit Start Test to immediately start the download test, which is automatically followed by the upload test. Results are saved below the speed test for you to compare with past scans. The CSV file you can create from your historical scans includes the date and time of the scan, your IP address, the server location, and download and upload speed. This is a great way to keep track of previous scans because Speakeasy doesn't let you build a user account to look at them later from. A concern I have with Speakeasy is that it requires Flash to be running in your browser. This means web browsers that don't support Flash, like Safari on iPhones, for example, can't use Speakeasy. Flash-based tests are also less reliable. See HTML5 vs Flash Internet Speed Tests: Which is Better? for more on Flash-based tests versus non-plugin tests that use HTML5. Some internet speed test websites make is really easy to share your results with others. This would be useful if sending your ISP or computer technician your bandwidth results. However, Speakeasy only lets you download a spreadsheet file of the results, while other sites give you a URL you can easily kick around if you need to. It's also too bad that Speakeasy supports testing your connection with only US-based servers. If the majority of the websites you visit are located outside of the United States, then you would get more accurate, real world results testing against a server in those countries. Speakeasy can also test jitter and measure ping speed with Speed Test Plus.